Since I picked up this little gem, I’ve been playing it incessantly. It’s a beautiful example of regional Mexican music, and it’s positively anthemic – rollicking, upbeat, happy, and played with finesse. The Trio Los Aguilillas performed local corridos, but they also issued discs of wonderful son huasteco from the various states in northeastern Mexico, son jarocho from Veracruz, and – today’s example – son michoacano. In terms of instrumentation, it’s fairly close to son jarocho, featuring guitar, a type of local jarana guitar (5 or 8 strings, depending on its origin), and the harp. Michoacán is one of the regions in Mexico where the harp – sometimes known as the arpa grande or even the arpa de tierra caliente – flourished. Traditionally, it is played while standing, and can be 3-5 feet tall, with a soundbox on it’s base acting as a resonator. While Aguilillas literally means “little eagles,” in this case it’s also a reference to the town of Aguililla, in Michoacán, the birthplace of the Trio, which was comprised of three brothers, Antonio, Pedro, and Juan Rivera. The brothers were taught by their father, Don Pedro Rivera, a local harpist known throughout Michoacán as a great interpreter of the region’s music. Eventually the brothers moved from the family’s farm to Mexico City, to try and make their living as professional musicians. Apparently it took years before their local music was accepted without being watered down. Ethnomusicologist and anthropologist Joseph R. Hellmer aka Raúl Hellmer (1913-1971) recorded them ca. 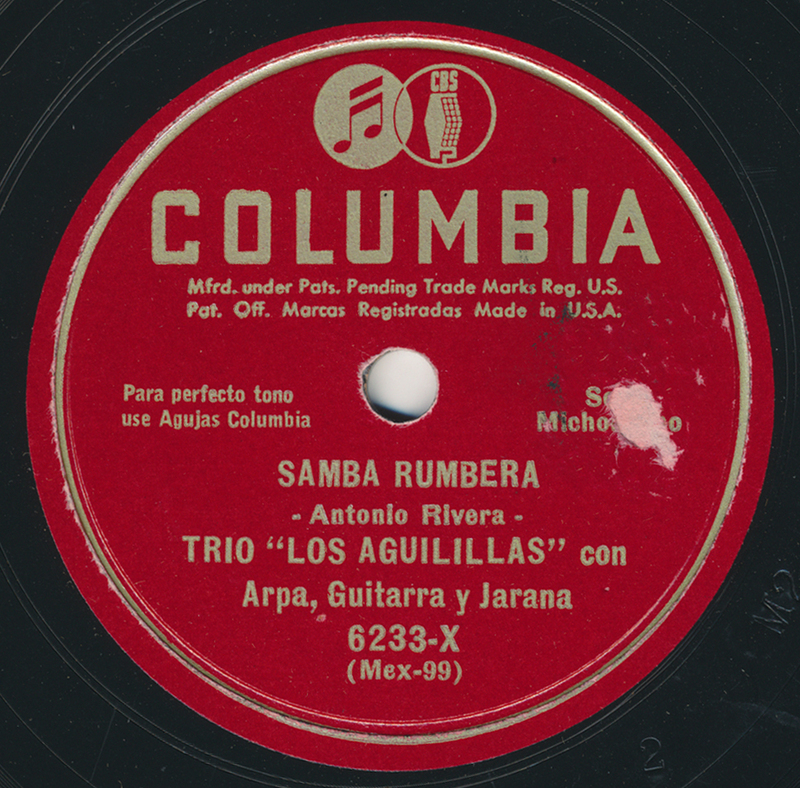 1950 as “Trio Aguilillas” and issued their 10″ disc on Folkways titled “Sones of Mexico.” This Columbia disc dates from around the same time. Good choice. I bought that very same record in 1973 or 1974. Then, around 1980, I went to a Mexican restaurant in Detroit where a harpist was playing. His name was Antonio Rivera. I asked him if he was the same Antonio Rivera as on this record, and I requested “Samba Rumbera,” which he played. Later I went back, with the record, and had him autograph it. Thanks, Paul – that’s a fantastic story! Sweet. Thanks for making this, and all the other beauties you’ve alerted us to, available. Nice little story too. Thanks a lot – I appreciate that! Beautiful! Nothing wrong with this red label Columbia! Thanks, gracenotes – you know it! Wow, such a beautiful song and another great post. Thank you for sharing! I just heard about your blog on public radio, and I am IN LOVE with it! How cool is this idea?!?!?! You are doing such an awesome thing by preserving this music for future generations. I’m going to get other people I know to follow it. Mr. Ward, do you have any information on the ‘Orquesta de los Bohemios Alegres’? Picked up their blue vocalion “Suenos de un Taberno” and it is very hot jazz. Thank you!